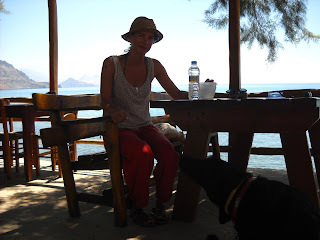 We recently had a short break in one of the most dog-friendly places I've found so far in Crete. Searching the internet, we found a few small hotels/rent rooms in the area of Rodakino (south of Rethymnon) that accept pets in their rooms, and we picked one at random. Our hotel - Oasis - was just above the small beach (Polirizos) below the village of Rodakino. The owners of the rooms were extremely friendly and made us (and Sage) very welcome there. 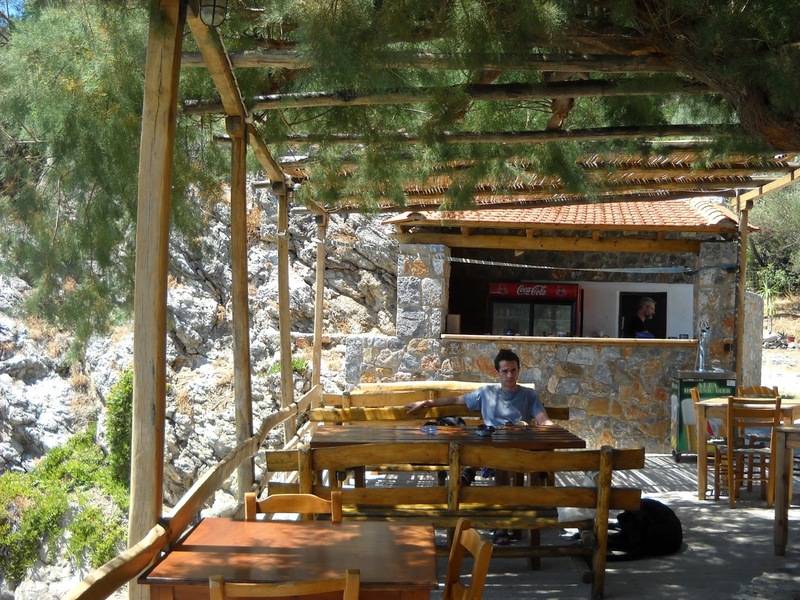 They invited us to drink raki with them, and for coffee, and they were very sweet about Sage. 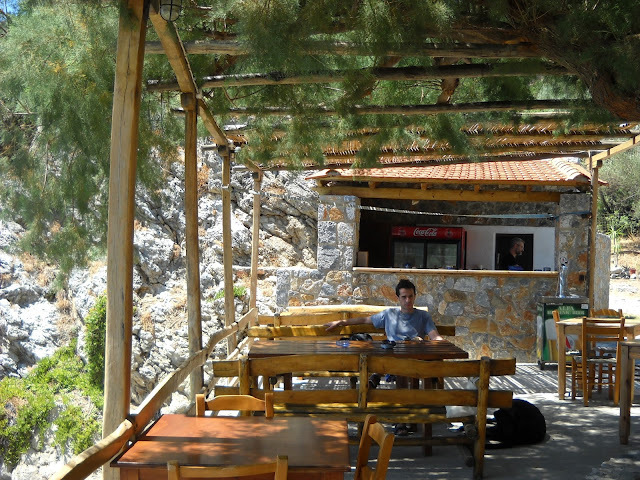 The room was fine, very clean, with great views from the balcony over Polirizos and the mountains to the east. I think the prices were a bit high, we paid 135E for 3 nights for the 'studio', but this was two single beds pushed together, and a tiny kitchen with a hob that needed one hour to heat water for tea in the morning. I met a group of Athenians who had brought their 2 dogs with them on holiday, who said they had been coming to Rodakino for years and staying at Nikos & Anna rent rooms. They told me their golden retriever goes for a dip in the sea 5-6 times a day while he's there! 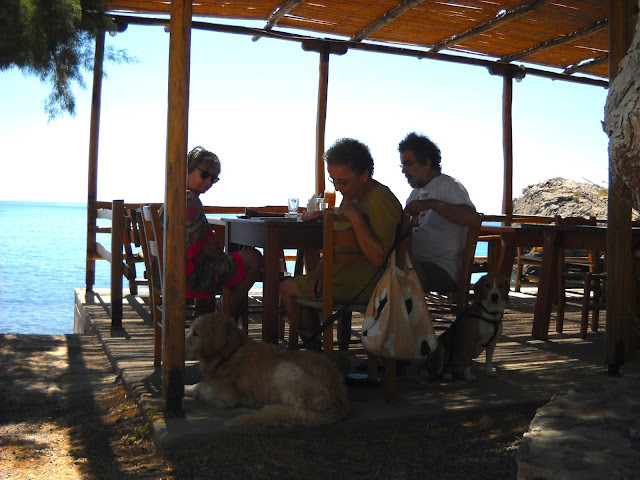 We were lucky that there were not many people on the beach below the taverna, and everyone there was very friendly to Sage. (The waiters didn't even seem to mind when Sage drank too much sea water and vomited on the cement floor by our table... we cleaned it up quickly and luckily nothing was said!) However, a short path and scramble over the rocks takes you to another, larger beach where there are even fewer people and no hotels (see later post), and if you continue a little round the coast you will find still more small coves and quiet beaches to escape to. A small note, there were a few stray cats around the taverna, fed by various animal-loving guests. They didn't cause too many problems, but one in particular looked like he could give Sage a good fight if he wanted. 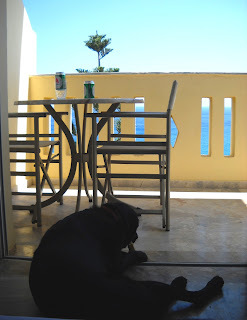 Even the posher looking Polirizos Hotel, set back slightly from the beach with imposing looking entrance and beautiful lush gardens, turns out to be dog-friendly (again free of charge, just let them know when you book that you will have your dog with you). The prices for this hotel turned out to be very reasonable to, about the same as for Oasis, with breakfast included! I didn't have time to check out the taverna, but passing by one evening it looked busy (in a good way), with a relaxed atmosphere. All the apartments and hotels advertise that they have WiFi. An important warning: we were very lucky with the weather, for the three days we were there it was not windy at all. Everyone told us, however, that for the three weeks prior to our visit, it had blown a gale - so much that it was painful and unpleasant to sit on the beach. Our last day the wind picked up again, and I could see what they meant! North winds causes the most problems on the south coast - it may be worth checking the weather forecast if you have the luxury of a last minute holiday. Otherwise, be aware that North winds can cause havoc on southern coast beaches, especially during July and August.